Wow, I cannot believe it is 2019. Admittedly, we’re already 1/12 of the way through 2019! I want to take a moment to apologize for my time away from social media and the TBL website towards the end of 2018 and beginning of 2019. Written by Levon Ritter, current student at Hampshire College studying music and history. Check out his Instagram for outfits featuring other bow ties from the Ties by Lucy brand: @indubitably.bowties. Winter, the season where the birds and vacationers from north of the Mason-Dixon line fly south. In the case of college students and working professionals living in New England or the Mid-Atlantic too preoccupied with work to travel, the best we can do is layer up and try to make it through the year’s cold snap. On the bright side, wearing some heavier clothing is no reason not to stay dapper and fashionable. For we Yankees, when it gets cold out the go-to piece of clothing to wear is a flannel shirt. However, let’s get some misconceptions about flannel out of the way. First of all, flannel originally referred to a type of fabric, and not a type of shirt. Traditionally it was made from wool, but now it can be made of different kinds of materials. Secondly, it’s common for flannel shirts to come in a tartan pattern. This type of pattern is synonymous with plaid, but the word plaid actually comes from a type of cloth in a tartan pattern that was part of traditional Scottish highland dress. However, for a bow tie-wearer flannel can make for a challenge when creating an outfit. For one thing, flannel shirts usually contain a variety of colors, sometimes clashing ones that will make your outfit look too busy with a bow tie. On the other hand, If you’re wearing a shirt and a bow tie with a similar color and pattern, it can really diminish the bow tie’s presence. So what exactly is fair and what’s faux pas when it comes to wearing you favorite bow ties and your favorite plaid shirt? One thing to consider is the size of the pattern of whatever you plan on wearing. Plaids generally have a larger pattern than what’s featured on your bow tie, but just in case remember the 60-30-10 rule: The largest pattern (your plaid shirt) should be 60% of the outfit, the second largest (in this case pants) would be 30% and your bow tie is the 10% that helps you keep it 100! It’s also considered distasteful by many to mix plaid with certain patterns like polka dots or paisleys because they’re both busy. Stripes on stripes and by extension tartan on tartan can also cause a stir. So as you can see, when it comes to wearing a plaid/flannel shirt or bow tie, suddenly your options become a lot more limited. However, here are some outfit ideas to inspire you and give you a chance to wear your favorite TBL bow tie and stay warm. Even though polka dots on plaid has a bad rep, as mentioned earlier, in this case of this outfit, the size of the pattern on the shirt is much larger than the minimal pattern on the bow tie, which makes the polka dots on plaid elegant instead of egregious. The bow tie in this case is also more saturated in color than the shirt, so it it can still properly distinguish itself. This is an outfit that’s good for a night out, or just a relaxed night in with some friends. Up close you can see that this bow tie has quite a few colors on it, some of which are pretty subtle. The plain, navy flannel is a great backdrop to showpiece this particular bow tie on. Just be careful not to spill your hot cocoa on it! This outfit is good to wear if you work in an office and you have a chilly commute. For extra warmth or style, you could try wearing a light brown suit jacket. This bow tie will definitely pop and contrast against the white shirt, but you’ll probably just get compliments on it from your coworkers. These are just a few ideas. There are definitely a lot of possibilities out there. If you’re not much of a risk taker, a plaid bow tie on a solid-color shirt should do the trick, as long as the colors are coordinated well. Otherwise, feel free to try and break/bend the rules. We won’t tell the fashion police. With Valentine's Day rapidly approaching, Ties by Lucy has you covered with the perfect gifts for those special men in your lives! Read more (and shop via the links!) below. 1. Chambray shirt - This denim shirt is a perfect fall staple. It can be paired with khakis, corduroys, and more. 2. Fun socks - What man couldn't use a few more pairs of socks? You can't go wrong with these, and they make the perfect stocking stuffers. 3. Ties by Lucy bow tie - Your man needs a TBL tie whether he has one already or not. Our ties are handmade in the U.S. and are perfect for all occasions. 4. Passport cover - Does your guy have a passion for traveling? This passport cover is perfect for your next vacay. 5. Book subscription - This monthly book subscription is perfect for the avid reader and makes the perfect gift. 6. Coffee table books - Help your guy create the perfectly curated coffee table. Featured above is 3 Ingredient Cocktails. Pair it with the "carry on cocktail kit" so he can make his own Old Fashioned on his next trip. 7. Decanter set - If you are shopping for a whiskey dude, what better gift than a decanter set? 8. Graphic tee - Shop our favorites (from a great gal and fellow entrepreneur!). 9. Sweatpants - These are the fluffiest, coziest your guy will ever put on. We are so excited to announce that Ties by Lucy is a featured vendor at The Big Fake Wedding Atlanta on Sunday, January 21, 2018 at Fox Hall Resort. Learn more about what that means by reading below and visiting the Big Fake Wedding website! The Big Fake Wedding is an experiential marketing event that has revolutionized the way wedding brands connect to those planning weddings. For brides and grooms, the event serves as a source of inspiration, a resource to finding trusted wedding vendors, and an emotional reminder to plan for what comes after the wedding: a marriage! The Big Fake Wedding "guests" are brides- and grooms-to-be who get to truly experience local wedding vendors in action. Each event showcases vendors' skills through a real vow renewal. What are the goals of The Big Fake Wedding? There are three: inspire brides and grooms, promote small and local businesses, and encourage solid and committed marriages. All types -- from wedding planners, to floral studios, to bakeries, to men's accessories (like us! ), any type of vendor you can imagine will be covered. See the below snapshot for some of them, and click on the link here to view the rest. How legit is this event? We'd say that the Big Fake Wedding's national press and media partners sum it up pretty well. See below for the partners. I'm sold! How can I get tickets? You can purchase tickets for $25 at the link here. Again, we are so excited to be a part of this year's show and hope that you all will join us at Foxhall Resort on Sunday, January 21, 2018. Please let us know if you have any questions or comments; we'd love to hear them! Exciting news from the TBL headquarters! We are pleased to announce that long-time friend and bow tie enthusiast, Joshua Grover, has joined our team! Josh is our Business Development Manager and oversees things such as store outreach and our Brand Ambassador Program. We are so thankful to have some extra hands, and we are excited for all of you to get to know him! Read a bit more on our exclusive interview with Josh. TBL: Tell us a little bit about yourself. Josh: I grew up in Villa Rica, Georgia and went to Carrollton High School until I graduated in 2013 with Lucy. I always loved swimming, and I swam for the Carrollton Bluefins since 1999. From there, I went to Carson-Newman University in Jefferson City, TN. I swam all four years I was there, and I was the captain for two of those years. I was pre-med in college and studied Biology and minored in Business Administration. Right now I'm in my gap year between college and med school, so I'm working as a swim instructor, zip line tour guide and business development manager for TBL. I'm hoping to get into Mercer's med school and head to its Savannah campus in August 2018. TBL: What got you interested in and connected with Ties by Lucy? Josh: I was a brand ambassador for many companies at Carson-Newman and also had experience running two businesses in the past. I felt like my experience fit with TBL's goals, and I also knew Lucy from school and swimming and wanted to help her out. TBL: What's your favorite Ties by Lucy product? TBL: What are you most looking forward to with the TBL Ambassador Program? Josh: I'm most looking forward to getting TBL products known across as many campuses as possible by working with a stellar group of ambassadors. Also, all of the fun things that I get to plan with our ambassadors to promote TBL on their campuses. TBL: Do you have any advice for incoming Ambassadors? Josh: Have fun being an ambassador! Even though we expect you to be professional, don't be afraid to try something out of the box. We ant you to enjoy your time with us, not dread it. Also don't give up on people/stores. Persistence pays off. TBL: Where do you see yourself in five years? Josh: I see myself graduating from med school and moving on to my residency. I hope to also be able to help out Ties by Lucy as much as I can during that time. Childhood friends of mine - Carly and Conner - tied the knot this past May, and we were so happy to have been a part of their big day! From Sunday School and mission trips with Carly, to pool parties and Capture the Flag with Conner, Carly and Conner have been friends of mine since I moved to Carrollton in the fourth grade. I was lucky enough to see their relationship evolve through high school and college, and I'm so excited to see where life takes them next. When Mrs. Mount approached me about making the ties, I couldn't have been more excited to make something for such great friends. I was thrown a challenge, however, when Mrs. Mount asked if I could make Conner a regular tie instead of bow tie. Unfortunately, I do not know how to make regular ties (I'm in the process of learning though!) so we found an alternate solution. Conner's grandmother made his tie out of the same fabric I made the groomsmen ties from. It was such a special touch to the wedding, and I am so pleased with how they all looked together! Thank you to Carly and Conner for letting me a part of your day - both through making the ties and attending the wedding! I am so excited to see your relationship grow for years to come. See some photos from the big day below, and be sure to check out more under the "Places" tab. Special thanks to A Thomas Photography for the photos. Meet some of last semester's wonderful Ties by Lucy Ambassadors! All 16 of our Ambassadors were huge assets to our team and provided TBL with the resources to expand and thrive. We know that this group of Ambassadors will be hard to replace, but we are looking forward to reviewing applications in the coming weeks. Read more below to learn about three of our previous Ambassadors and what they have to say about the Brand Ambassador Program! Mina is a rising Senior at Augusta University and was an Ambassador for Ties by Lucy for the Spring 2017 semester. Mina's positive attitude and desire to learn made her an exceptional candidate and intern. Mina helped improve the application process and was quick to share TBL products with all of her friends throughout the semster. Thank you for all you did for TBL, Mina! Luke is a rising Junior at the University of Chicago. Luke jumped right into his position as an Ambassador and got 450 Ties by Lucy flyers placed in VIP bags at the University of Chicago's MODA Fashion Show and made sure TBL was included in the show's silent auction. We appreciate all of your hard work, Luke! Emily is a rising senior at the University of North Georgia. Emily's ambition and dedication led her to constantly be on the look out for ways to market TBL. From posting flyers, to discovering craft shows, to sending in photos of TBL products while she was on Spring Break, Emily went above and beyond. Thanks for everything, Emily! 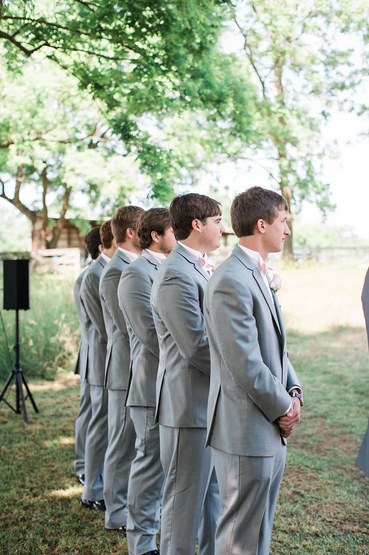 When sorority sister Amy came to us with a special request for her wedding, we couldn't say no! Amy and Matt dated throughout college at Georgia Tech, and Matt has recently moved on to Emory for Medical School and Amy has begun working at Chick-fil-a corporate for her "big girl" job. Amy and Matt got married a few days before Christmas, and their ceremony and reception were at Foxhall, just west of Atlanta. Amy's bridesmaids wore deep red gowns, which were such a great fit for the holiday season. The bow ties matched the dresses perfectly and were a wonderful addition to the overall feel of the wedding. Browse photos from the big day below and under the "Places" tab. Special thanks to Vic Bonvincini Photography for the stunning images! Another year has flown by, and it has been arguably the best yet for Ties by Lucy! From making the ties for multiple weddings, to donating over 40 ties and generating over $2,000 for charity, to having our first customer in Africa, to creating our first product for women, we went above and beyond our original goals for the year. Read below for some of our favorite memories of 2016! 1. We partnered with Wish for Wash, a non-profit based out of Atlanta. Wish for Wash aims to improve sanitation infrastructure through implementing toilets in Africa. We donated over 40 ties and helped them raise over $1,600 to reach their $25,000 goal. 2. We expanded to another store, River Road Pharmacy & Gifts in Columbus, Georgia. This store marks our first ever wholesale account, and we couldn't be more thrilled for more to come in the near future! 3. We made bow ties for multiple weddings this year. Some of our brides were sorority sisters, and one was last year's Miss Georgia Tech! Weddings are so exciting because we get to customize ties for the bride and groom, and we get to see beautiful photos from their big days. 4. We launched our first ever women's product, a bow tie bracelet. It's so fun to expand product lines and create items for women, and we loved getting to partner with Carsyn Leigh for a giveaway. 5. Our owner and crafter, Lucy, studied abroad in Europe this past summer and took along a koozie for photos along the way. We love getting photos from customers in cool places like the Georgia Tech/Notre Dame game, Piedmont Park, and more! We are SO thankful for our customers and supporters around the globe! In 2017, we are looking forward to launching our Brand Ambassador Program (apply at www.tiesbylucy.com/affiliate-program), developing new product lines (can you imagine TBL dog collars?! ), and updating our blog + social media + email newsletters a bit more often. Check back in with us to follow along with all of our changes! We are SO excited to announce that we are now offering products for women! It all began with our friend, Carsyn, of Carsyn Leigh and her new home goods line. We loved her Lilly Pulitzer inspired items and wanted to team up a bit. So, we decided we'd come up with a bow tie that women can wear! Although Carsyn Leigh served as our inspiration, the women's bow tie bracelets are a Ties by Lucy original. The bracelet measures 17-18 centimeters long with a bow that is 9 centimeters wide, but we can make any custom sizes (and prints!). Shop our Lilly-Pulitzer-inspired bow tie bracelet (pictured below) now while you wait for even more styles to be put in the shop. Do you have an idea for the perfect bow tie bracelet? Comment below or email info@tiesbylucy.com today! Another wedding is in the books, and it was our first summer 2016 wedding. 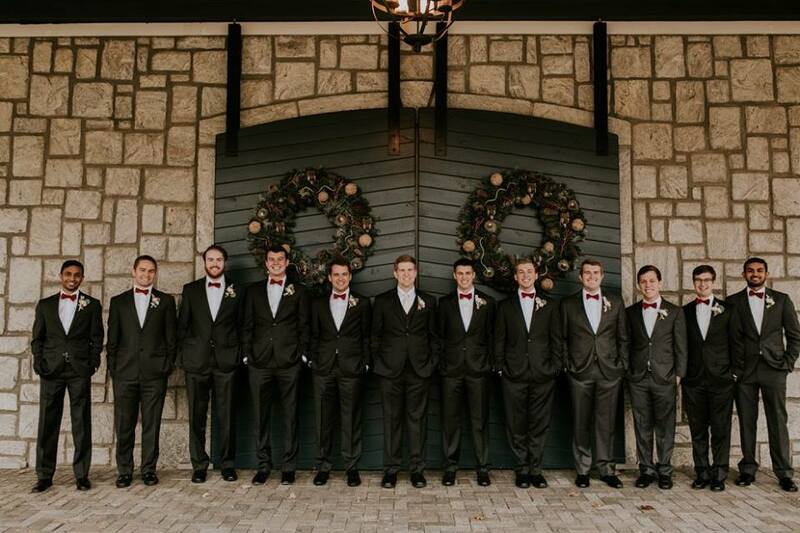 Not only was it special because Ties by Lucy produced the groomsmen's ties, but also it was great because our owner and crafter was a bridesmaid in the wedding! The original fabric Lucy purchased was from a local fabric store in Atlanta. The store, Gail K Fabrics, provides large quantities of many many different types of fabric. Lucy took the time to match fabric and show options to Annalise and Caleb before making a final decision. She purchased the fabric and began working but soon realized the material was too stretchy and just wouldn't work for the ties. Luckily, there was time to get more fabric in the right material. The new fabric also matched perfectly, and the ties turned out perfectly. 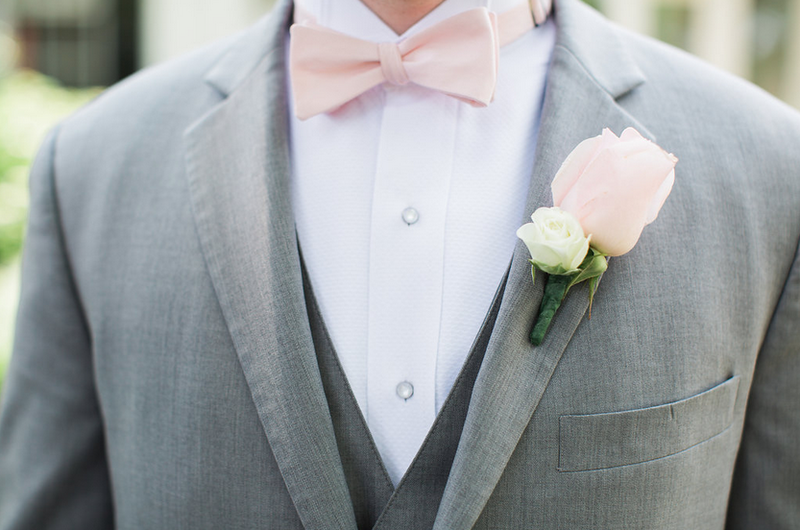 The groomsmen along with the ushers and ring bearers sported beautiful baby pink bow ties that matched the bridesmaids' dresses perfectly. If you are interested in custom, handmade bow ties for your wedding, please get in touch by emailing info@tiesbylucy.com. 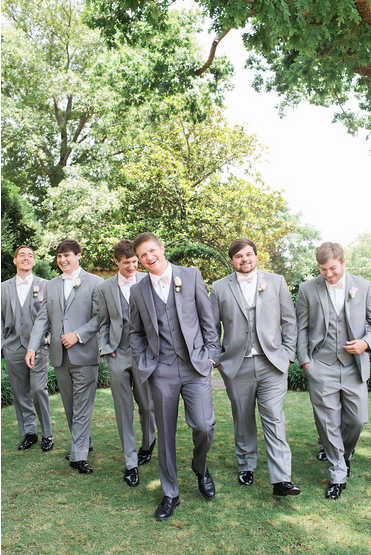 We'd love to help you find the perfect bow ties for the big day! Ties by Lucy has done a fundraiser before, but not quite in the scope of our latest. Last November, Ties by Lucy partnered with Wish for Wash, a non-profit started by Georgia Tech student Jasmine Burton. Jasmine and the entire Wish for Wash team work to implement toilets in Zambia, Africa. Jasmine is passionate about improving community health via redesigning water, sanitation and hygiene (WASH) infrastructure, which is why she founded Wish for WASH, a social impact startup that seeks to bring innovation to sanitation. This year, she is serving as a Global Health Corps Fellow in Lusaka, Zambia and is working as a design specialist at the Society for Family Health. Jasmine states, "I identify as a humanitarian design activist and, ultimately, I seek to use my creativity to make the world smile." While an undergraduate student at Georgia Tech, Jasmine and her team worked together to compete for the InVenture Prize, the largest undergraduate invention competition in the United States, at Georgia Tech. After competing with other teams, her team won and received help kickstarting the toilet production. Now that she is in Zambia she's able to put all of her design work to the test by implementing the toilets, called SafiChoo toilets, that she has created. How is Ties by Lucy able to help? We partnered with Wish for Wash to donate bow ties made of chitneage (African) fabric to people that made a donation of $40 or more to Wish for Wash's Indie Go Go campaign. Together, we were able to raise over $1,600 through selling bow ties. We are so excited to be a part of such a cool project, and we want to continue to help Jasmine and Wish for Wash in their toilet endeavors. If you missed the initial campaign, feel free to email tiesbylucy@gmail.com to donate to Wish for Wash and receive a chitneage bow tie! Read more about Jasmine and her organization at http://psiimpact.com/2015/07/improving-sanitation-through-empathic-design-meet-jasmine-burton-a-psi-global-health-corps-fellow/.